Tired of a messy garage floor? Want to keep it clean and dry in the winter months? Want to track less dirt and grime into your home? Then check out this cool new Clean Park Heavy Duty Garage Mat. 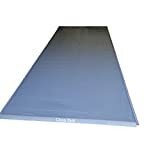 This heavy-duty vinyl mat with raised edges catches gallons of the melted snow, mud, slush, oil drips, and more from your car to help keep your garage floor clean and extra safe. Great garage solution, especially if you live in snowy areas. Available in various sizes to accommodate most vehicles and even things like snowblowers, mowers, and more.